This module looks at how increasing temperatures due to climate change have affected sea level rise and what effects scientist expect in the future, given rising greenhouse gas emissions. The various mechanisms of sea level rise are discussed, as well as the tools and research used to study this topic. The module also discusses how countries and communities are preparing for future increases in sea levels. I think it was good and there were enough visuals given. Helpful and great learning tool. 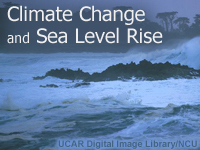 These lessons are great for someone who is learning about climate change and sea level rise. MetEd is very useful for all subjects. This will help students expand their knowledge. I liked this lesson much more than the one I did before. This one was easier to understand and spoke in terms of a person that didn't have to be a geologist to understand. This is an easy to understand module. I had no idea that such a large portion of the global population lives so close to an ocean. i learn alot from cliamte change that i didnt kmow. It was a good lesson to learn bout. It was a good lesson to learn about. and I recommend it to all the students who are interesting in geography. This was a very good detailed slideshow of climate change and sea level rise it was very interesting to watch. The only thing I would change is the narration - I was told that this should take 2-3 hours, and the talking was slow enough that it might have if I had chosen that method. It took me about 20 minutes to read everything and complete the quiz, so maybe just speed up the narration a bit? It is well-presented and good to learn about the topic. There should be more information on sea level impacts to the small and low lying islands around the globe. Great introductory primer on Sea Level Rise. it was a great one cause i never go in depth with this topic. It teaches me a lot of new information. Good to understand the rising levels of seawater. I live in a coastal zone that the seawall has been higher. very informative I learned a lot of things about the sea level rising and the seriousness of it. Good compact lesson to learn from. This lesson was interesting and informative, however; I had to pause the video numerous times in order to search the meaning of certain acronyms or geographical terms. That was the only negative issue about this lesson, it would be a better idea if there are explanations or definitions included. useful and such a helpful lesson to our generations and generations to come! The way the lesson is outlined is very simple to understand and the informations given in this lesson is very helpful. very good lesson. very informative. Informative and relevant to whats going on in the world regarding climate change. Clear and informative with fantastic photos and really interesting videos along with clear and easy to understand charts and diagrams. Excellent Module. It is simple, yet informative.